If you make a coffee table that express a mathematical idea and place it right in the middle of your living room, that certainly makes a statement to all who visit that math is central in your life. 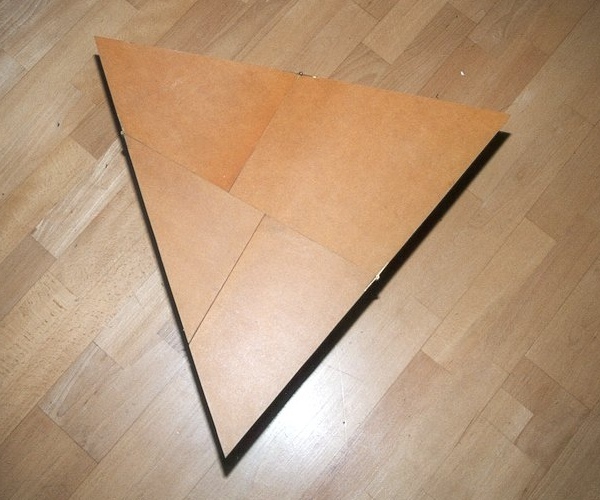 If the owner so chooses, the coffee table can be turned into a triangular shape (shown below). So, the question becomes, what math can we do with this? What questions are there to ask? Of course, how could we answer those questions? The first two questions that I have are based on the function of the coffee table. 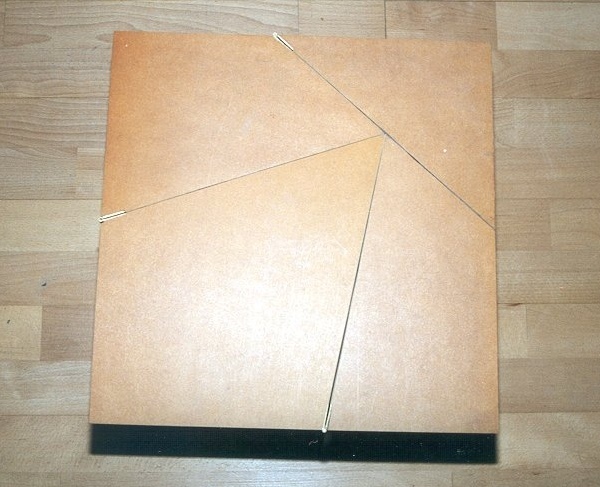 Which shape maximizes the number of people who can sit around it? Which shape maximizes the amount of stuff you can put on it? How could we answer these questions? Are there other questions we can ask? Apparently that happens every time a drop of water hits a bigger body of water. I have watched this video three times already and I find myself getting more and more fascinated every time I watch it. First of all, the fact that so much beautiful complexity can exist beyond the detection of our eyes is amazing enough, but the nature of the complexity, the wonderful symmetry, and the transformational nature of it blows my mind. Anyway, what does it have to do with geometry? That’s your job. What questions can we ask about this video? When you think of a question, think about what information we would need to answer the question and beyond that, think about if the video gives us enough to find the needed information. Ritz Cracker Problem – Episode III from Andrew Shauver on Vimeo. This third installment of the Ritz Cracker Problem adds a bit of advice as to where you could go in terms of solving some of the problems posed by Episode II. Keep in mind that while I provide the 2-D rendering of the problem, this is very much still a 3-D problem. My goal in showing the 2-D representation was to give the student an avenue to travel in the event they were stuck. If there are any other questions that you can think of other than the 3 questions posed in the video, then post them in the comments. Be creative! [WCYDWT] Coke v. Sprite from Dan Meyer on Vimeo. I remember the first time I saw this problem on dy/dan, I couldn’t help but share it. The question is simple: Which glass has a greater amount of its original soda? My daughter loves oatmeal. She (a 26-lb toddler) can easily consume enough oatmeal in one sitting to satisfy a grown man. (I will leave the math of THAT statement on the sidelines for the time being). However, this morning, I was making my daughter a serving of Meijer Naturals Quick Oats (delicious, nutritious, cheap, easy) and I was struck by the instructions. So, for one serving, you use 1/2 cup of the oats and 1 cup of water. Simple enough, right? Here is where it gets hinky: For two servings, you use 1 cup of oats (double, right?) but only 1 and 3/4 cups water (less than double). Now, to make matters more curious, After the instructions for one serving and two servings, the instructions skip all the way to six servings. 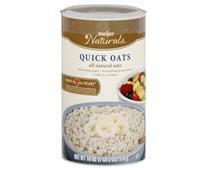 To make six servings of oatmeal, you use 3 cups of the oats and 5 and 3/4 cups water. Now, this seems to be something of an odd progression… at least to me. I mean, what happens if you need to make 3 servings? or 4 servings? or 5 servings? Can you make any recommendations about what combination of oats and water I should use to make 3 servings? or 4 servings? or 5 servings? Or how about 10 servings? Post your answer (with support) in the comments. Ritz Cracker Problem, Episode II, Act I from Andrew Shauver on Vimeo. In keeping with the theme du jour, I have added a second version of the Ritz Cracker problem which adds in a different element to the problem. But, in my attempt to add a Dan Meyer-ness to the problem, I am only revealing Act I. After watching, I want you to note any observations or questions in the comments below. What math could you do with this video? What information do you have can you pull from the video or from your real life experiences? What information would you need to go further? Ritz Cracker Problem, Episode I from Andrew Shauver on Vimeo. In geometry class, we almost always talk about cylinders as soup cans, toilet paper rolls, or Pringles containers. That is, a hollow container of some kind. These tend to be good examples because it makes for easy images of the surface area and volume. But what if the cylinder in question was a stack of congruent circles? How would that change the way we looked at the cylinder? Better yet, can it help us understand them better so as to be able to move on to bigger things, like composite figures and maybe even calculus!